DIRECTIONS: To download MP3 samples: PC users - right click over 'download mp3' and "save link as ...", MAC users: control & click 'download mp3' and "save linked file as ...". Click here to report any problems. 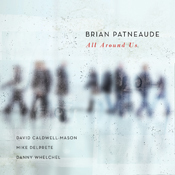 "With All Around Us saxophonist Brian Patneaude delivers a bravura performance as both artist and composer." "A collaboration of jazz tradition, new creative influence, and personal evolution ... This is jazz with a solid vision: clear and forward." Examiner.com "The album is the best in Patneaude’s decade-long career, with songs drawn from life and given life by this crisp and seasoned ensemble." The Daily Gazette "A finely crafted album that develops and molds its space and time to develop a coherent and well paced set of very enjoyable music." "An engaging and highly pleasing recording." "Evocative of Chris Potter, Michael Brecker, Mark Turner and Joshua Redman." "An exciting, surprising, thoroughly enjoyable listen." Crumbs.net "Patneaude's always been a great player, but the levels of revelation in All Around Us shows he's becoming a great artist"
"Thoughtful, harmonically intriguing tunes executed by a fine quartet ... Flaunting a burly tone and a depth of feeling in his lines, Patneaude reflects the influence of Michael Brecker in both his playing and composing." "Riverview is a truly fine collection of original compositions and tunes by Don Grolnick and Billy Strayhorn that have been given a modern shine." 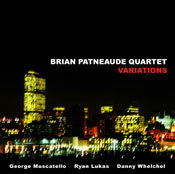 CD Baby "Editor's Pick" "Patneaude always brings a questing and highly organized intelligence to his projects, but theres something special, a real advance, in the melodic flow and force of this music. The saxophonist, composer, arranger and bandleader has hit a new plateau of inspiration and performance in this eight-song album ... He takes more risks than on previous efforts, confident in the expert support of his bandmates, and the risks pay off every time." "A chilled contemporary mainstream bop sound." "Music need not be overly cerebral, deep, or out there, to evoke meaningful contemplation. Sometimes a strong melody, solid musicianship, and intelligent composition are all that is needed, and Riverview proves that point." AllAboutJazz.com "The quartet seemingly plays all the right notes during this irrefutably compelling album that should find itself on a legion of 2009 top-ten lists. 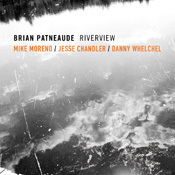 (Don't miss out...)"
JazzReview.com "With any justice, Riverview will reward Patneaude's initiative, pushing his horn and his hometown band up to the next level." Jazz & Tzaz, Greece "Patneaude and crew explore a post-Michael Brecker world of accessible, melodically astute and harmonically textured music"
Jazzwise, UK " ... his quartet brings to mind the best work of Chick Corea, Herbie Hancock, and others from the era." " ... a wonderful album filled with memorable tunes that stick in the mind, played with a joy that is infectious. 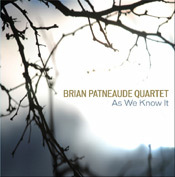 Patneaude and the band are masters of telling a story." "This is a magical disc that yields a little bit more musical treasure upon each return." Metroland "... high-caliber jazz performed with gusto, determination and a persuasive vibe." 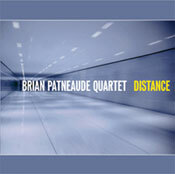 eJazzNews " ... another collection of well-written, well-performed originals ... Patneaude's lines and fills here have the clarity and conciseness that were hallmarks of Michael Brecker; however, the beauty and maturity Patneaude brings to As We Know It is all his own." "This is smart music that doesn't brag about its IQ, or its hipness quotient. It's music that embraces melody and adventure in equal parts without a trace of irony. It's music that's fearlessly spiritual without ever preaching. It's music with heart." Jeff Waggoner - contributing writer, Jazz Times " ... teaches listeners a thing or two about pace ... The disc is filled with winding build-ups and fresh timing." Syracuse Post Standard "Distance is a solid winner from start to finish." "Distance has muscular, straight-ahead blowing, some lyrical ballads  "Alone" may be Patneaudes most evocative slow melody ever  and some change of pace surprises." "The group is extremely tight and its music is like nothing else. Sounding at various turns exuberant, soaring, grooving, or longing, it leaves you in suspense from one track to the next about what is going to happen. Even within a track, the music is never predictable, and many times the band's total sound can sweep you away." AllAboutJazz.com "... deceptively accessible, flavored with rhythm and melody thats fun and funky and sure to lift your spirits. Distance stays with you." Metroland " ... an outstanding CD, absolutely no question, one of the 5 best I've heard this year." Albert Khalis Pride, Jazz Exodus (5/5 stars) "Distance continues on in the pattern established by Patneaudes debut, seamlessly incorporating world rhythms and textures, tasteful shadings of free-jazz inspired oddity, and smoky slow groove, all of which are threaded together by Patneaudes unfailingly lyrical and melodic tenor." "A highly accomplished debut recording that truly is the sum of some excellent parts"
The All Music Guide (****) " ... a super-hip sound ... perfectly balances inventive improvisation with slippery-smooth melodies for a sound as refreshing as it is classic." Seven Days, Burlington, VT " ... a fabulous recording ... amazingly fresh in both concept and execution"
AllAboutJazz.com "... a wonderful, tightly supportive combination of a wide variety of elements ... performed at the highest level of musicianship"
"A Place For Jazz" "... fresh melodic modern jazz played with passion. I expect these guys to be of a higher profile very soon."